Budget constraints have cast considerable doubt on plans by the South African government to restart its solar water heater support scheme. Despite the setback, the solar thermal industry is optimistic in outlook because the country’s building regulations have been driving demand for SWH systems. Furthermore, there is hope that South Africa’s Department of Energy (DoE) will soon pay all arrears owed to manufacturers for the storage and delivery of systems that were bought by the government while the support scheme was in operation. The flow of subsidies stopped in 2015, when utility Eskom handed over control of the programme to the DoE. The photo shows a combination of solar thermal collectors and PV panels, installed on the roof of a residential building near Cape Town. These regulations, called SANS 10400–XA, entered into force in September 2011 and stipulate that at least 50 % of hot water demand must be met by devices that are not electric resistance heaters. This requirement extends to both newbuilds and houses that are soon to be renovated, provided such renovation needs approval by local planning authorities. Following a transition period and a thorough discussion among those affected by the new rules, XA became law on 9 September 2014. According to Jan Visser, Managing Director of flat plate collector manufacturer Adzam Solar, the main driver of the South African solar thermal market since the national subsidy scheme came to a halt has been the price of electricity. Indeed, annual sales declined only slightly in the years after 2014, when the subsidy programme was no longer available, so that other drivers, such as electricity prices and the building regulations, must have stimulated the market instead. 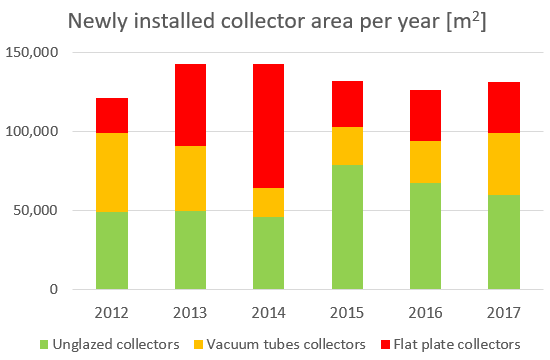 Figures taken from Solar Heat Worldwide, a yearly study published by the IEA Solar Heating and Cooling programme, show that vacuum tube collector imports fell significantly after the stop of the programme. Data from the Solar Heat Worldwide study by the IEA Solar Heating and Cooling programme. Figures for 2018 have not been available yet, although initial estimates predict an increase over 2017. About 450,000 residential systems were partly or fully funded by the national SWH support programme from 2008 to 2014. The initial aim was to install one million solar water heaters. The only support schemes left are some small government ones to supply free low-pressure solar water heaters to new townships, according to Liddell. These programmes are being managed by the DoE, but implementation has been put in the hands of the Central Energy Fund and the independent power producer project. “The delay in refunding the costs of systems that had been purchased under the national subsidy scheme until 2014 previously led to some level of uncertainty, which has caused job losses. One company even shut down,” said Carolien van der Horst, Business Development Manager at the SA Capital Equipment Export Council, which helps engineers and associated bodies focused on the capital equipment and contract sectors with new projects and the after-sales market. Liddell confirmed that the multiple delays in inviting tenders, processing contract awards and paying for delivered equipment have driven several suppliers out of business. “To date, the DoE has paid manufacturers for their solar water heaters, but the storage, insurance and security fees that came out of the manufacturers’ own pockets are still outstanding, which has created severe cashflow problems for them through no fault of their own,” said van der Horst. Considering the government’s current budget limits, the industry has great doubts as to whether South Africa will again provide support for SWH systems in the foreseeable future. This article was written by Shem Oirere, a Nairobi-based freelance business journalist focusing on energy, construction and chemicals.